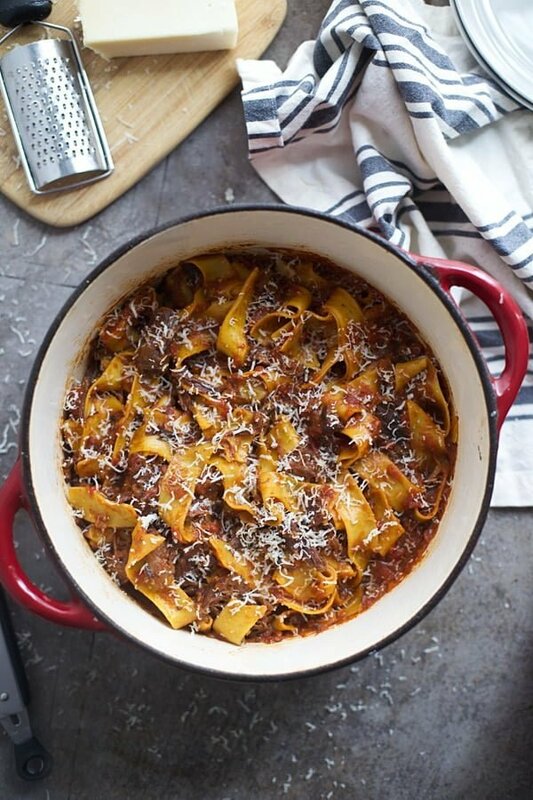 This One Pot Short Rib Bolognese is exactly what what I want to eat every snowy winter night from now until eternity. It’s rich, hearty, and the perfect meal to cook low and slow all day long. I’m not normally a heavy, meat- sauce kind of gal when it comes to pasta. On the contrary actually, I prefer a creamy white sauce bathing my noodles most of the time, but once winter hits, give me all the spaghetti & meatballs, all the pork ragu, and all the hearty meat-based, red-sauced pastas you can. 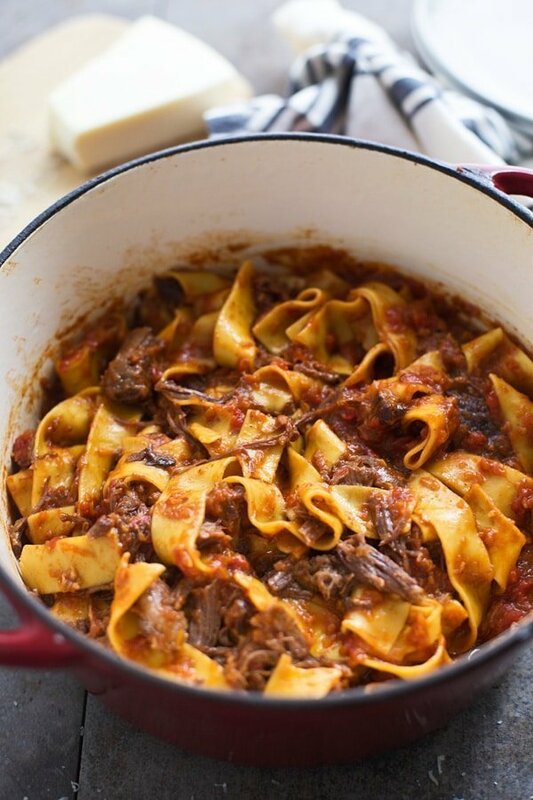 There’s something about a slow-cooked ragu or braised meat that to me, screams winter. And much like a bowl of soup, can bring back that warm glow the blistering air seems to steal away. Both as I’m cooking it and while I’m inhaling it. Bolognese is one of my favorite meat sauces to cook on a day where I don’t feel like leaving the house, since it cooks nice and slow and gives me a reason to stay huddled near the stove. Buuut I also love the texture of a braised cut of beef or pork, so I thought I’d join the two forces together for the perfect Bolognese braised hybrid. In short, a meat sauce. Typically it’s slow-cooked over a very long period of time, anywhere from three to four hours. It usually has some type of red or white wine in it, and it almost always has some sort form of dairy to finish it off. Most recipes call for whole milk, but I actually just skipped it in this version. You could definitely add it at the end if you want to stay closer to a true bolognese. 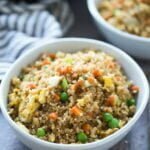 It’s also chock-full of aromatic veggies such as chopped carrot, celery, onion and garlic, and then it’s slow cooked with the wine of your choice, canned tomatoes, and a few other seasonings. Basically it’s simmered on a low heat until it’s reduced, thick, and not only permeating your entire house, but basically your neighbor’s house as well. It’s that intoxicating. Typically it’s made with ground beef or pork, but I just adore the richness of short ribs and associate them with this time of year, so it made perfect sense to swap out the ground beef and pork for them. Plus, it’s just a little fancier than ground beef or ground pork. Here, the short ribs are first cooked up in a touch of butter and olive oil until they’re super brown and crusty. From that point, things are pretty standard. The meat comes out, the veggies go in, and they get sautéed until softened. A heavy hand of white wine is poured in, reduced, and then tomato paste, crushed tomatoes, and seasoning goes in. It’s all cooked low and slow until the meat is falling off the bone, and PERFECT. Also, I almost forgot, I like to throw in a parmesan cheese rind or two in to the mix — this step is a must! It adds this luscious, nutty and buttery underlying flavor that I just can’t get enough of. 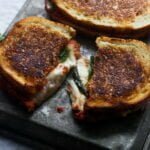 I always stash a few in the freezer when my parmesan cheese runs out and then pull it out as needed. You know it’s done when the meat is melt-in-your-mouth tender, all of the short ribs come out, a little bit of liquid is added in, and the egg papparadelle goes directly in to the pot to cook while you shred the beef. Before serving, the beef goes back in to the pot with the pasta, it’s seasoned with salt and pepper, covered in parmesan cheese, and it’s ready to go. Keep in mind, you may or may not need more liquid as you go. Depending on the moisture level in the air, you might need to add a little bit more water if you see the sauce is drying up. You can also use beef broth if you have it on hand. 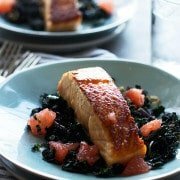 For more one dish, check out these posts! Also, be sure to follow us on Pinterest, Instagram and Facebook! 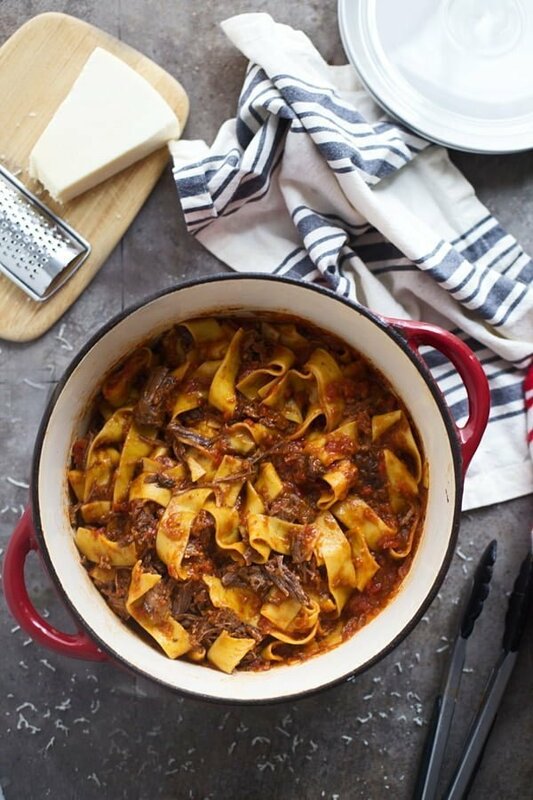 This One Pot Short Rib Bolognese is exactly what what I want to eat every snowy winter night from now until eternity. It's rich, hearty, and the perfect meal to cook low and slow all day long. Heat a large dutch oven to a medium-high heat. Add butter and olive oil. Once butter melts, add beef. Cook beef until brown and crusty on all sides, about 10-15 minutes. While beef browns, add carrots, celery, onion and garlic to a food processor. Pulse until finely chopped. After beef browns, remove from pot. Drain all but 2 tablespoons of fat, and add carrot and celery mixture along with ½ tsp. salt. Reduce heat to medium and sauté until softened, about 3-4 minutes. Add tomato paste. Cook for one minute. Pour white wine in to pan. Simmer until reduced by half, about 3-4 minutes. Throw in remaining salt, canned tomatoes, sugar, cinnamon, nutmeg and parmesan cheese rind. Stir until combined. Put short ribs back in the pot. Bring to a boil and reduce heat to low. Cover with a lid and cook on low for 5 hours or until meat is fork-tender and falling off the bone. Remove short ribs and parmesan rind from pot. Stir in water. Bring to a simmer and add in pasta. Again cover and simmer until pasta is cooked, about 10 minutes. If needed stir once or twice to prevent pasta from sticking to bottom of the pot. As pasta cooks, shred beef. 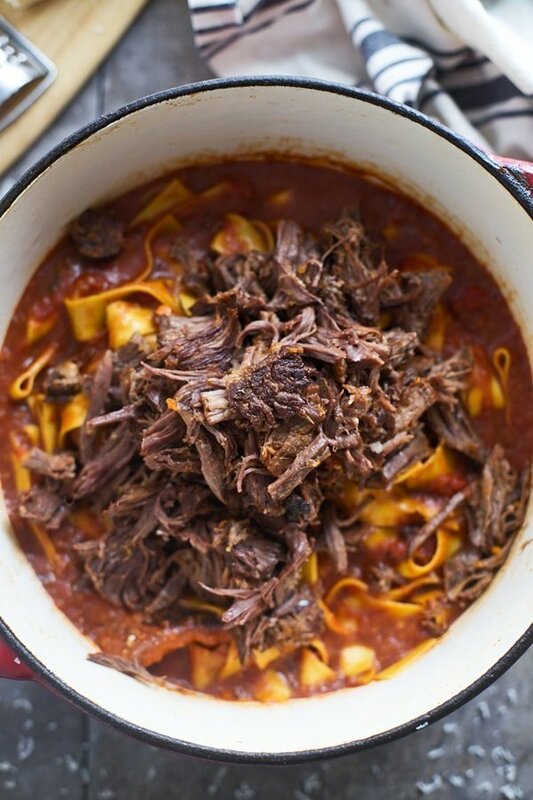 Once pasta has cooked, add beef back in to the pot. Toss together. If necessary, add a bit more water to thin out the sauce. Season to taste with salt and pepper. Garnish with parmesan cheese. 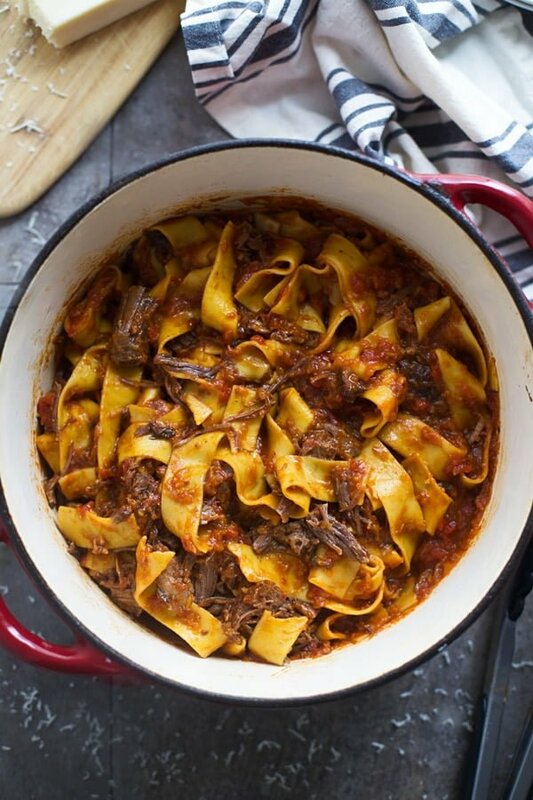 93 Responses to "One Pot Short Rib Bolognese"
Omg! It’s like you read my mind. I have been looking for a bolognese sauce recipe to make for Christmas Eve and this one looks like perfection. Can’t wait to try it. I’m going to make this for new years eve! Looks awesome! Dumb question…. In step 4 what does “Once beef bowls, remove from pot.” mean? Does bowls=browns? Yes! It’s once the beef browns! I noticed a couple other grammatical errors, recipe is updated now. I hope you love this! I can’t wait to try – but would red wine compliment the tomato flavors more than white? You can definitely use red wine, but I like white for a change! I promise, it’s still delicious and works perfectly! Glad you liked it anyways! What cut of beef did you end up using?? I bet it would be great with another cut! Glad you liked it! Excited to make this for a wine get togther tomorrow. I will serve it as a small plate pairing for an Italian varietal. Question: do you add any milk in this version? Thx! Hi DeAnn! Nope, but if you want to add some for creaminess, go ahead, I’m sure it will only make it better! Good luck! Thanks Nicole for your timely reply! I’m starting it now and will add a little half & half at the end. Will let you know how it goes over with this foodie group today! This dish easily won Best Meal cooked ever by my grown 3 sons and husband. So glad you liked it Susan!! I bet it would work great in the crockpot as long as you brown the ribs first! Hi! I’m trying this tonight – can’t wait. I’m assuming step number 4 is not “once beef bowls” but “browns”. My grocery store didn’t have beef short ribs so i had to use cut up sirloin. Let’s hope it works! Thanks for recipe. Haha yes, browns. Typo! I have never used sirloin, hopefully it works! Just make sure to cook it until it shreds. OMG! This sounds sooooo good! Can’t wait to try!! 😀 Do you think it would be any good with pork ribs? I’ve never tried it with pork ribs, but I think it would be fine. Making this as we speak! While the beef is simmering for 5 hours, sbould I put a lid on my Dutch oven? Mine’s making the house smell AMAZING as I type this, so thanks for the recipe! It’s for dinner tomorrow, so I’ll take the meat out tonight and won’t add the noodles to the sauce until we’re ready for dinner. YUM! should i drai nthe tomatoes? I usually make this type of dish the day before and refrigerate it. The following day, I remove the solidified fat before warming it again and then add the noodles. I frequently add some butter to the noodles or the entire pot of sauce. We have made this twice the second is for a large new years party. So good made a triple batch. Turned out perfect, thank you for sharing this gem. We will be making this all winter long. Thanks again and be safe. Making this now! It smells amazing! One silly question- do I cook the sauce covered? Not a silly question at all! Yes!! Covered. I actually used a smoker with no smoke of course. It runs 275degrees for four hours. Outside because we are in florida and it is too hot to cook like this inside. Finished on stove top it was fantastic. Have you finished the meat and veggies in The oven rather than stovetop? If so what temp? And would time be the same? I haven’t, but I think it would work great. I’d cook everything on the stove up until you simmer, and then pop it into a 350 degree overn for a few hours until it’s tender! Not sure where I went wrong. Turned out like soup and the cinnamon is over powering. It was a waste of good and expensive short ribs. Will it be much of a difference if I don’t use the Parmesan rind and just use grated Parmesan? So, the rind infuses more flavor into the sauce, so I’d recommend using it, but if you don’t have access to one or two, you can just add cheese. Whole rind or cut up? 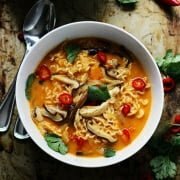 Do you know if anyone has ever done this recipe in an instant pot? I really want to try it for dinner tonight. I’m not sure! I know I haven’t, but I bet it would work with some tweaking! I’ve never done this before but I have never tasted anything like this before. Layer upon layer of flavor. Even my husband couldn’t find anything to criticize about it. No tweeking needed. Made this for my husband’s birthday dinner this evening….AMAZING! My family couldn’t wait for dinner because the house smelled delicious all day as it cooked! Thanks! So glad you liked it Laura! This sounds amazing. I want to make this Sunday, but I do not have a dutch oven. What can I use? I do have a crock pot, would it work like a dutch oven? So sorry for the delay Jennifer! You can just use a heavy-bottomed pot. I haven’t tried it in the slow-cooker! Love hearing this! Thanks Kathy! I am wondering about beef broth and why there is none in this recipe as all traditional Bolognese has this ingredient. Is it because short ribs bring enough flavour to the dish? You do not need beef broth! One of my guests can’t have alcohol. Would you recommend substituting chicken or beef broth? Water? This sounds delicious and I can’t wait to get started! You could sub either! Just make sure to check seasoning! Do the whole tomatoes eventually break down? Not sure if you’ve mentioned this somewhere else but do you have the butcher cut the meat into a particular size or do you just use whatever they give you? 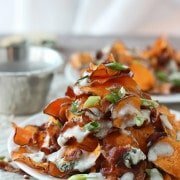 This recipe looks amazing and I can’t wait to make it! They are usually pre-cut. I make sure to pick out the ones that have the most meat on them! Some fat is ok and good, but you don’t want a short rib that’s ALL fat. Hope this helps! Made this yesterday. It was really good and made it just like the recipe stated with 1 addition. I added a couple shakes of red pepper flake to the onion, garlic, celery and carrot mix. Added just a little kick to the sauce and is a great addition. Great recipe! The blog mentions adding whole milk or half and half, but I don’t see it in the recipe. How much should I add? My wife sent this recipe to me and we had it for dinner tonight! Absolutely delicious! Our new favorite meal. Thanks for creating this! So glad you liked it Sean! Looks delicious I was just wondering before I make it are the noodles fresh or dried? They are dried, BUT they are dried pappardelle noodles from Trader Joe’s and don’t take as long to cook as say, spaghetti. You can still use any kind of dried long noodle, it just may take a little bit longer to cook and you may need to add more liquid. Fresh pasta also works great with no adjustments needed! Oh my gosh, I’m making this now and my whole house smells amazing!! I did substitute red wine for the white, and it is delicious! 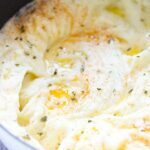 Thank you so much for posting this recipe, I’m sure it’s going to be a favorite! Do I add milk to this at any point? In the middle of cooking this now, and my husband and daughter are loving the smells flowing through the house!! I read in your article to add milk at the end, but your recipe doesn’t call for it. Am I missing something?? Making this at my husband’s request for about the 6th time in a year! Delicious recipe, I actually serve the pasta on the side (picky kids and family with Celiac) so I do not add the water for the pasta. I have noticed a few times I need to add a small can of diced tomatoes. Reading all the comments, I will be trying the beef broth suggestion today. Thanks for such a great recipe. Love to hear this Katy!!!! When I added the short ribs back in to cook for 5 hours the sauce was really thin. Will it thicken over the next 5 hours? Also should I turn the meat throughout the next couple hours? It will, and you will need the sauce loose to cook the pasta. This is amazing . I’ve made it a few times exactly as the recipe says . If this came out wrong for you, then you did something wrong . I think the key is that you have to let the short ribs simmer for 5 hours. If you take them out and try to shred them at any point before that , they will still be tough. Gah! Planned on making this for dinner and just realized I have boneless short ribs! What do you suggest I do? Drown myself in my hungry sorrows or is there a fix? You are fine! Just prepare the same way! They probably won’t take as long to cook, and just make sure to take out all the fat before adding the shredded meat back to the pot. It’s been about 4 hrs and meet is cooking great. I made it just as recipe stated but it’s still really watery. I’m a pretty decent cook and know how to follow directions. Is there a way to thicken it? Have you added the pasta yet? The pasta will soak up any excess liquid. If it’s still too loose, you can whisk a few tablespoons of flour with a 1/4 cup of cold beef stock, then add it back to the mixture and let it thicken. I think I accidentally purchased the wrong type of Parmesan cheese rind, the whole thing has melted. Is that going to matter? It’s fine! Sorry for the delay!